Last week, I hosted a private movie screening premiere featuring this film at Century 9 in San Francisco, in collaboration with Allied SF (big shout out to Marilyn!). In promoting this event, I did a fan ticket giveaway and was told the download capacity was just about gone in one day. Prior to this, I didn’t know much about the movie, but thought it was a fun way to showcase a movie where the main character is a woman pro wrestler. When I finally did my research, little did I know it was based on a true story about a sister and a brother, who were destined to be in the pro wrestling industry by way of the family business and earned an opportunity to try out for the WWE. As someone who won three world boxing titles, I also lived a life in the professional combat entertainment industry and instantly connected to the plot. Finally! A real life story about people who dared to make a living in following their love of controlled combat–I’m in! I’m a sucker for underdog stories and I love the premise of “be the first you.” Don’t we all struggle with that everyday? I won’t give any spoilers here, but will share my top five thoughts and quotes that came to mind after watching the movie. What makes any story of adversity worthwhile are the choices made in those moments: does one stay true to oneself versus submitting to social norms? How do you decide? In preparation to good decision making, some people try to plan things out. So what do you do if you are the first of your kind? How do you know what’s right? Or what’s wrong? Who has your back during tough times? What do you do when no one else in the world believes in you except you? Do you fear opportunity and the glory of failure and triumph? How good can you take it? As it’s been said: Good decisions come from experience, and experience comes from bad decisions. Our attitude during favorable times versus undesirable ones dictate how far and how fast we move from one phase of our lives to the next. When a fighter steps in the ring and takes the biggest blow of her/his life for the first time, a question flashes in a split second: Do I throw in the towel? Or get right back in there and finish the round? Decisions are made every second in the ring as in life. On a personal note, going to the premiere was the first time in over a decade (maybe even two) that I went to the movies with my family. 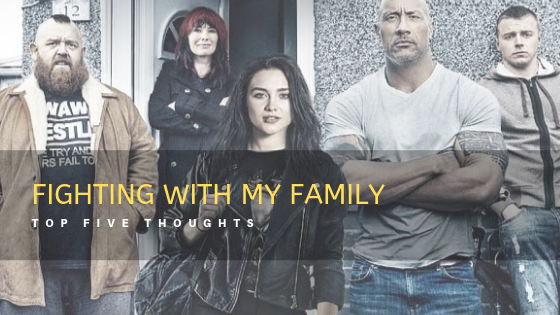 As Vern Glenn says in his review, Fighting With My Family is the first “Feel Good” movie of 2019. It was an absolute joy to see the three generations within my family sitting together having a wonderful time watching a brilliantly entertaining family movie. As I mentioned earlier, not quite a review, but more so my thoughts on fighting and how it reflects in every aspect of our lives. This movie depicts that and shows the essence of what we all encounter in our own lives on a daily basis and reminds us and inspires us to find greatness in everything, through defeat and victory. Fighting With My Family shows in American theaters on Friday, February 22. If you decided to watch it, come back and share your thoughts in the comment section below. Share this with someone you know who would like to read it. Subscribe to the email list for more updates and giveaways. Training tips COMING SOON! Reading you has been very interesting. I think I’ll remember this. Thank you Jack! I appreciate you! Oh, wow. Now, I have to re-allign my thoughts, my impression of you.our Aside from being good daughter to your 2 Mom & Dad (who is a fellow Pozorrubian) & our beautiful boxer, you are a writer! Perfect composition & grammar! So proud of you!